Funniest Chewbacca Video of all time is close to breaking the Facebook if not The Internet, so far the video has scored 140,544,800 views on Facebook alone. Candace who is now a star mother of two amazing kids from Texas had her birthday recently. On her birthday, she decided to gift herself ultimate children’s toy a Chewbacca mask. She then made a video of herself in her car discovering her inner child and bursting into laughter. 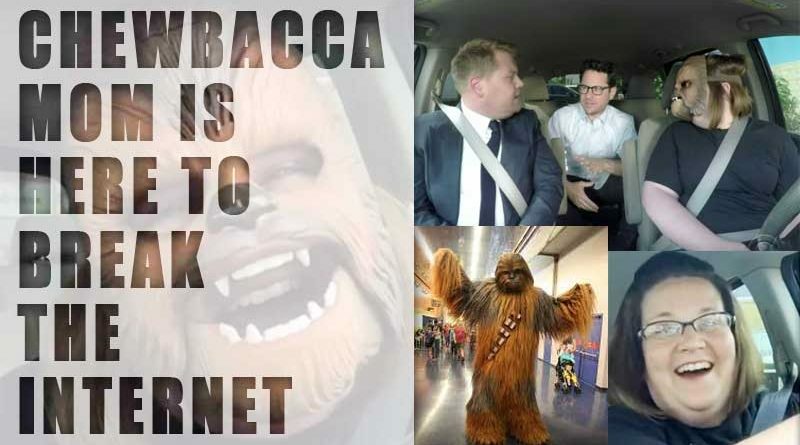 She was not aware that her video might get super viral, soooo viral that ‘Chewbacca Mom’ even got the chance to Carpool with Star Wars Director J.J. Abrams and James Corden (WATCH THAT VIDEO HERE or Just click the next page number).